This article is in response to a forum entry by Hawks58 about ways to paint SENMM. The thread can be found at http://www.coolminiornot.com/forums/viewthread.php?tid=1705. I should point out that although I haven't had much experience with painting NMM on minis, I've been an artist for as long as I can remember, and an avid collector of the works of Hajime Sorayama, an artist known for his hyper realistic chrome work....and naked ladies!Ahem...Hawk58's problem was a sword which he (or she) was trying to paint in SENMM. It kind of looked like this. It looks ok, but the reflections just aren't right. It's very important with any complex shape to break it down into simpler ones, so ideally the sword should be divided like this. Taking the red area first, Hawks58's approach was pretty spot on, so I'll leave this bit alone. With the blue area, it's important to consider what part of the surroundings the chrome is reflecting. In this case the shape of this part of the blade is concave, unlike the red part which was convex, so the blue part will be painted in the opposite way to the red part, the bottom edge of the area reflecting the sky, and the top the ground. 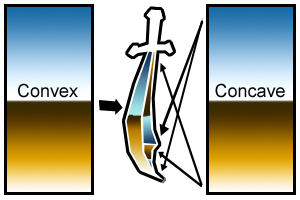 Just to illustrate this last point about the difference between convex (bending out) and concave (bending in) reflections, here is a small diagram. Now, because the green area is basically the same as the blue area in shape, just smaller, we'll finish it in the same way. So there you have it. I must just point out however, that the angles of the horizon will be in direct relation to the angle the blade is to the ground, so it will change on a figure by figure basis.Hope this helps Hawks58.